If you managed to survive The Period of Purple Crying with your baby, your next big hurdle will be to overcome teething and teething pain. Going through baby teething can be a frustrating ordeal for us parents, since the pain and discomfort of teething can lead to poor eating or sleeping in babies, and of course, crying and fussiness. 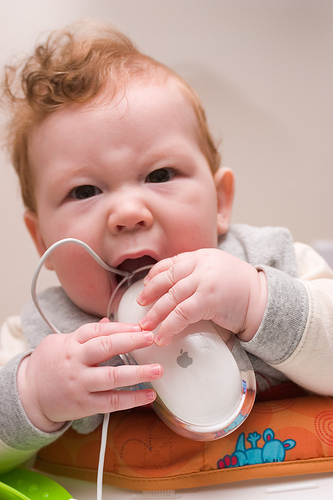 Babies start teething at different ages. Smarty Pants got his first teeth at 5 months of age, and Sweet Cheeks, who is now 4 months old, seems to be following in the same direction, as she starting to show signs of teething. What are the signs of teething you ask? Well, if your baby suddenly starts drooling non-stop, so much so that you have to change your shirt every time you carry her with her head on your shoulder, she may be teething. If she is biting on anything and everything she can get her hands on, including her own hands and maybe even yours, those teeth might just be on their way. Irritability, poor sleep and poor eating are other signs that your baby may be teething, as well as fever. If any of these symptoms occur, however, and you are not sure what to do, contact your pediatrician or family doctor. I’m not a doctor, I’m just speaking from my own experience, so take your doctor’s advice above mine. What can you do to help your baby while your waiting for those pearly whites to make their way through those rosy gums? There are several ways to help relieve the discomfort and pain of teething. I recommend using only natural products and methods with your baby, unless the pain seems to be very severe, in which case you should consult with a doctor. Teething rings: When your baby is teething, he wants to bite, bite and then bite some more. This helps to soothe the discomfort, and also helps to wear his gums down, helping those tiny ivories to break through. Teething rings are a great way to give your baby something to bite on. We like the ones that are filled with water, so that you can put them in the fridge or freezer before giving them to your baby. That way, your baby can bite on a nice, chilly, teething ring, helping to soothe those sore gums that much more. Chamomile Tea: Chamomile is a natural herb with wonderful soothing properties. You can make some chamomile tea and freeze it like a popsicle. Rub the frozen chamomile across your teething baby’s gums. The cool sensation combined with the chamomile’s natural soothing agents will send your little one into baby teething bliss. Homeopathic Teething Remedies: There are several homeopathic remedies on the market that combat teething pain. Homeopathic remedies are natural remedies that help to stimulate your baby’s natural healing response. Check your local pharmacy, drug store, or natural foods store to find out what homeopathic teething remedies are available in your area. Amber necklace: When we lived in Vienna, Austria, almost every second baby had an amber necklace around its neck, and amber necklaces could be found in every drug store and pharmacy. It turns out that amber necklaces are a commonly used natural teething remedy in Europe. We never tried using one, but from what I have heard, it works for some babies and not others. It may work for yours, so you might want to give it a try, but don’t be disappointed if it doesn’t work for you. Also, you should proceed with caution when thinking about using an amber necklace, being careful that the necklace does not somehow strangle or choke your baby. So there you have it…some simple, practical, natural ways to help your little bambino or bambina through this time. We prefer natural remedies, like those mentioned above, over medicinal remedies, because we are wary of giving medicine to such a small little being unless it is absolutely necessary to do so. Also, check the ingredients carefully with anything that you buy, whether it is medicinal or not. Teething biscuits may sound great, but they often have sugar in them. Even the organic ones may contain cane sugar. Do you really want to start rotting your baby’s teeth before they even pop out? To me it just doesn’t seem logical to put sugar in something that is supposed to treat teething. In any case, I hope you found these ideas helpful and that they have opened your eyes to some new methods that you might not have considered before. Whatever methods you try, I wish you the best of luck! Do you have any other ideas for natural teething remedies? What has worked for you and what hasn’t? Please leave a comment and let us know! i cannot recommend these highly enough. our daughter was an absolute nightmare with her teeth until we tried this. she has been wearing it since she was 8 months old and we haven’t looked back since. i never take hers off, she sleeps with it on too. i have heard from a few people that take their lo’s necklaces off at night and they all say that they still get sleepless nights due to teething. i think that they should be worn 24hrs a day. i feel quite happy that they are not a choking hazard. the necklace has a low breaking strain so if it had to get caught on something(an unlikely occurence) then it would snap. if it were to snap for any reason, each bead has been double knotted on, so that they wouldn’t all fall off.